Discussion in 'Tarantula Chat' started by T Frank, Dec 30, 2007. My remaining C. leetzi sling and my P. ecclesiasticus female both moulted within the last 24hrs. Pamphobeteus sp. 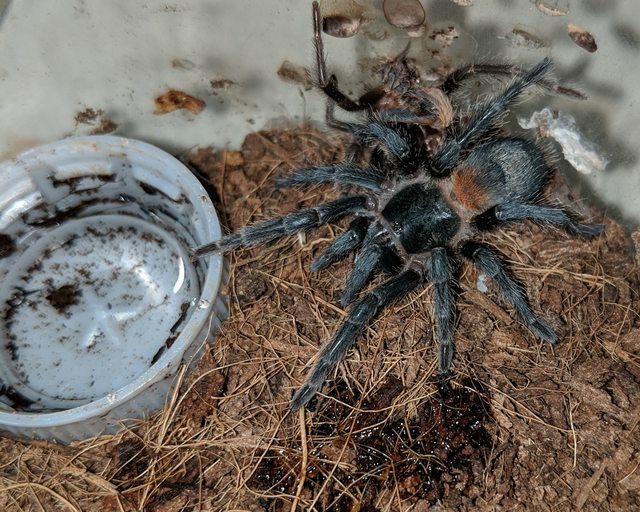 "Machala" molted today and is looking very blue. I'm not at home at the moment. I'll take some photos with my proper camera when I get home. C.marshalli sling in the process of molting right now! Either that or drunk! My B.emilia sling moulted the past night and isn't the smolest of my slings (I hope, these guys really are slow growers). I'm hoping to see a bit more of the colors this time around since this species is why I returned to the hobby. I'll try and get a couple of pics once it hardens up and ventures out from its hide. P. sazimai sling molted last night. I can't tell if it's getting blue colors or if it's just the post-molt softness that makes it look light. We shall see. C. Laeta & C. Versicolor slings. First of the Lampropelma nigerrimum arboricola slings I haven’t sold yet molted to 3i today. Cyriopagopus lividus sling molted recently too. Spotted a molt at the bottom of the burrow today but the fangs are already black on the spider. H. chilensis surprised me with a moult. Previous moult dates were Feb 9th and Nov 28th, so I thought I'd be in for a longer wait. This is the second time it has gone a long time between, then had a series in much shorter succession. So jealous! I wished mine would do that, but its moult cycles are all over the place. First one was over nine months, second one was 2 months, and now it's already been 4 months since the last moult. By the way, gorgeous, gorgeous little T! My G. pulchra sling molted yesterday, it's beginning to show adult colours. I. mira molted after a month of premolt. Looks about 1" now. P. victori molted yesterday, first molt in my care and it seems to have doubled its size. Can’t really see it in the photo, but my Poecilotheria striata female moulted. As did my Asian forest scorpion. Hopefully see her out and about at night again.